A website has posted a video message which shows a man who appears to be the Iraqi insurgency's most wanted leader, Abu Musab al-Zarqawi. In the tape, the man says holy warriors are fighting on despite a three-year "crusade". US experts told the BBC they believed the recording was genuine. The Jordanian-born militant has until now only been linked to audiotapes, photos, and masked men in videotapes. 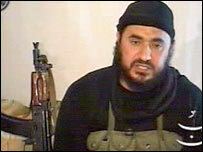 Zarqawi's insurgent group rebranded itself al-Qaeda in Iraq in 2004. He has been accused of orchestrating attacks and suicide bombings against US-led forces and Shia Muslims in Iraq and has a $25m bounty on his head. The fugitive militant is also suspected of personal involvement in the beheading of the American Nick Berg and the Briton Ken Bigley. The video was posted on a website that Zarqawi's group often uses to issue messages. One part of the recording shows a man - who bears a strong resemblance to previous pictures of Zarqawi - sitting on the floor and addressing a group of masked men with an automatic rifle at his side. "Your mujahideen sons were able to confront the most ferocious of crusader campaigns on a Muslim state," the man says. Addressing US President George W Bush, he says: "Why don't you tell people that your soldiers are committing suicide, taking drugs and hallucination pills to help them sleep?" "By God," he says, "your dreams will be defeated by our blood and by our bodies. What is coming is even worse." The speaker in the video also reproaches the US for its "arrogance and insolence" in rejecting a truce offered by "our prince and leader", Osama Bin Laden. Speaking Arabic in a slow monotone, the man lambasts the newly-formed Iraqi government as a US creation, designed to ease its predicament in Iraq. A US counter-terrorism official has said the man in the video does appear to be Zarqawi and the message is intended for propaganda purposes, as an apparent show of unity among Iraq's insurgents. This would be the first time the al-Qaeda leader in Iraq has shown his face in a video message. Parts of the video show the bearded insurgent dressed in black with an assault rifle beside him - the same posture adopted by Osama Bin Laden in many of his videos. According to the BBC's Jim Muir in Baghdad, the statement comes at a time when radical Islamists within the Iraqi insurgency are trying to unify their ranks. The video bears the logo of the Mujahideen Shura, or consultative council, an umbrella group of insurgents formed to resist efforts by the US and Iraqi authorities to win over Sunni supporters of the insurgency.